Learn how to cook five different quintessential Japanese dishes during this hands-on gastronomy lesson, in the private home of an Osaka local. Discover the role of key ingredients like seaweed and dried fish and watch a live demonstration before rolling up your sleeves and tackling recipes on your own. Then, enjoy your freshly prepared meal together, topped off with a bowl of green tea ice cream. Meet your host Yoko in front of Kohyo supermarket, outside Exit 4B of the Minami-Morimachi station and walk to her home together. 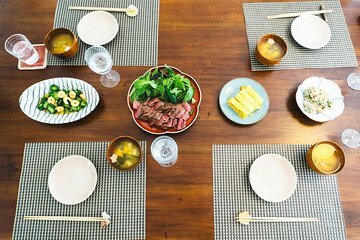 Please note, this is not a commercial cooking class, rather this experience is a visit into a Osaka home to meet a local who is an expert cook, and share Japanese culture and cuisine together.